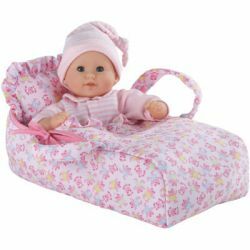 This charming teddy-bear print carry bed with matching pillow allows make-believe moms to take their favorite doll wherever they go. Fits up to a 12" doll. (Doll sold separately.) Ages 18+ months. By Corolle Dolls.